The London Marathon couldn't have been on a more perfect Sunday. We joined Cheer Dem Crew at Mile 21 to cheer and support all the marathon runners passing, saving our loudest and nuttiest cheers for Run Dem Crew members! The vibe was amazing - just pure ecstasy and happiness. If we felt like this standing on the side line, you can only imagine how the runners felt. Jamie, one of our fellow Run Dem Crew member (WHADDUP! ), was fortunate enough to get a place in this year's London Marathon alongside 36, 000 other runners. Running a marathon is a great achievement, but running your second marathon in the space of 8 months (with races in between) is something else *SPUD*! 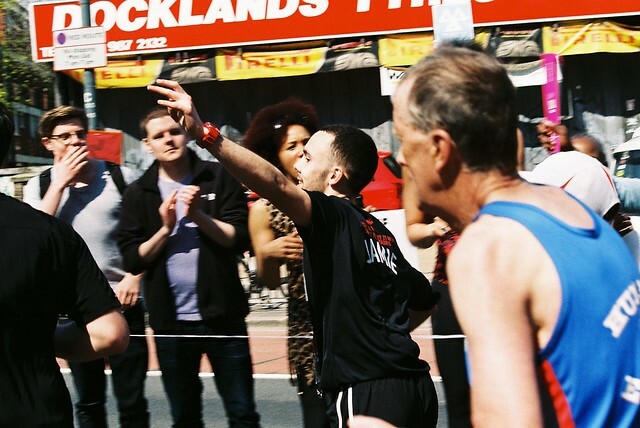 The exhilaration of running his city, running on home turf is shared with us today with a lovely guest post from Jamie, taking us through his 24 month running journey and how it was all down to one man. I found out I’d be running the London Marathon the day I got back from my first, Berlin in September of last year, which filled me with a mix of emotions. Excitement fed off the buzz of just completing my first 26.2 mile race combined with exhaustion at the thought of having to put in all that work again after a few months off. Either way I was still haps as I'd heard how amazing London and the crowds were every year during the marathon, you hear stories of how many people apply to get into race but miss out year after year so surely it was popular for a reason? The lead up to London however didn't go as I’d ideally planned training wise. Due to mainly work commitments the amount of time I’d hoped to put into training wasn't doable or realistic and I found it hard to get in more than 2 or 3 runs a week, compared to the 5 solid runs a week I was managing when training for Berlin. Nonetheless having to squeeze in runs when I could around work and everything else made me appreciate the free time I do have and think about the people who can’t for whatever reason dedicate themselves to things they wish they could. As the months drew in I knew I couldn't do anything to increase the amount of training and so I decided that I’d do London for the ‘fun’ (how fun is running 26.2 miles really though?) of it and just try and enjoy the day instead of aiming for a PB. 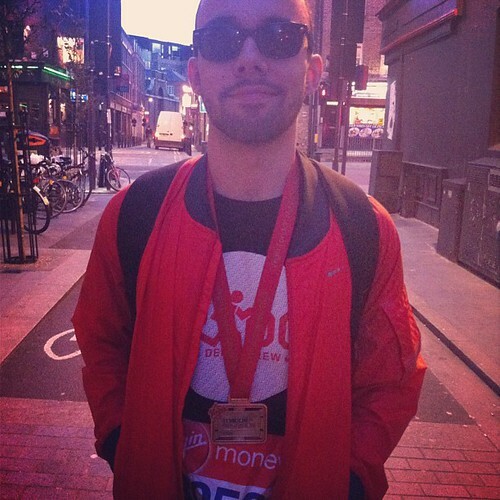 Just a week before the race something happened that led me to think again about what I was doing London Marathon for, even why I run in general. The bombings at Boston Marathon shook a lot of people but for a variety of reasons. Previous acts of terror carried out on innocent members of the public are always extremely distressing and bring fear to the lives of many but for me personally the events that took place at Boston Marathon hit home just a little more. Completing a marathon is no joke; it requires a certain amount of dedication, resilience, dedication and heart. The thought of coming to the end of something so triumphant but to then have it ruined and snatched from you is soul destroying. Regardless of who it was who carried out these merciless acts. 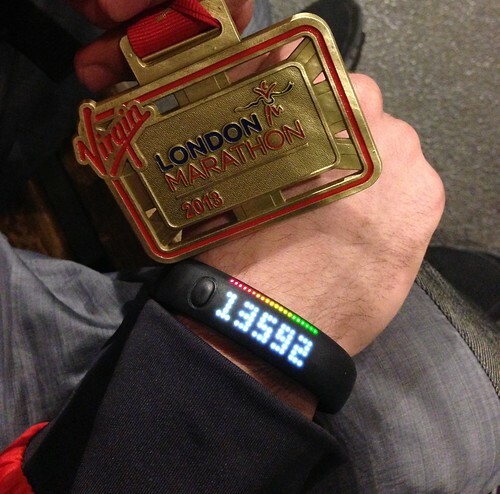 One thing is for sure - it made me want to run the London Marathon even more. Not for a new personal best but to show that an act like the Boston Marathon Bombings wouldn’t stop the thousands of runners or myself take part in something that we work so hard for to complete. The race itself started slow, a whole lotta people and a whole lotta tight roads created a whole lotta bottlenecks. Coming out of the pens, the roads were immediately lined with hundreds of people who were cheering on friends, relatives and strangers. Straight away I spotted a Bridge The Gap placard strapped to a lamppost and from then on all my focus was on Mile 21. The first 10k felt good, the weather making everything a whole lot more enjoyable. Reaching half way around Tower Bridge was dope, seeing people 5 deep cheering everyone on as I passed over The Thames helped me to pick up the pace and continue on. Around Mile 17 my lack of training started to show it’s effects, my legs were becoming tired earlier on than in Berlin and I started to question how long I’d be able to keep this pace for. Vibrations on my arm kept me strong knowing that I was receiving messages of encouragement and support. I didn't get to read them until the end but just knowing they were there made a massive difference. Again, the thought of reaching Mile 21 to see friends and family kept me going and soon enough the miles went by, slowly but surely. Passing Mile 20 I knew I’d see everyone soon and started to recognise the area from cheering on runners from last year. Turning a bend I could see Run Dem Crew banners ecstatically shaking in the air and the screams of the crew became louder as I approached. Looking back at it now I wish I slowed down to be able to take it all in more, it seems like a blur trying recollect who and what exactly I saw but one thing is for certain – I came out of Mile 21 like a greyhound on speed. Until you actually run through Mile 21 with everybody roaring and cheering you on you won’t be able to understand just how much of a boost it gives you both mentally and physically. I had Goosebumps before I even went through, knowing that I’d be able to see everybody. I came out the other end hiii-asa-muufuuc*er. 5 and a bit miles to go and I knew it wouldn't be easy, my legs were really beginning to slow down and every now and then I’d get a weird twitch in my left leg. Approaching Blackfriars it became more and more evident that I had to be careful, seeing people collapse on the roadside hovered over by paramedics only a few miles from the finish became an unwanted familiar sight as the race snaked around Embankment. I saw one women stumble to a slow fall as she went into some sort of fit and her whole body became solid – then it became really real. I told myself I needed to stay hydrated and switched on, I may feel OK but the sun was getting slyly warmer so it was vital I kept tanked up. Reaching Big Ben I knew I didn't have far to go, the temptation to stop kept growing but I knew if I did it would be harder to start again. Birdcage Walk along St. James Park provided a bit of shade from the sun and as I swerved round towards the finish I was hella relieved it was almost over. Nearing the end I thought about how I’d got here and it’s all down to one guy. Charlie Dark. I always try to thank Charlie whenever I can for what he’s done for me, not for the sake of saying thank you but because he genuinely changed my life and brought so much to it – not just running wise but has opened doors for me too whether it be socially or work related. 2 Years ago I’d never ran more than a mile. 24 months later I’d completed 2 10ks, 4 half marathons and 2 fulls. This is entirely down to him and what he’s created and is not down to a £45 a month membership at the gym. C.D., I salute you. 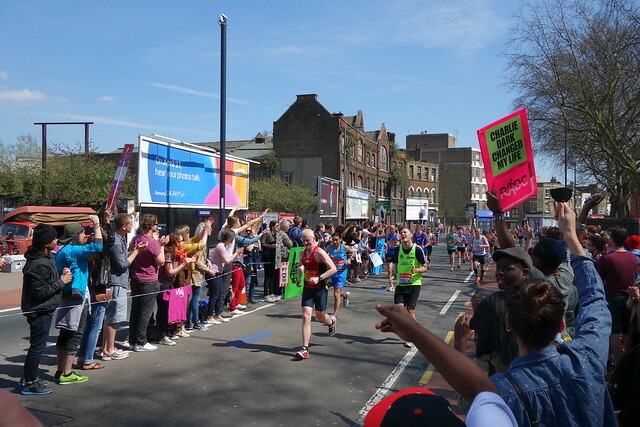 We may not have ran this year's London Marathon, but being right there cheering the runners on and hearing all the great stories from Run Dem Crew members who took part has inspired us. It is definitely something we will do in our lifetimes *adds to bucketlist* - hopefully for some of us (ahem KIM) we will be lucky enough to do it sooner, than later.